Updated, Monday, December 11: The SFPD identified the officer involved in the Dec. 1 shooting as Officer Christopher Samayoa. He has been assigned to the Field Operations Bureau. Police have not found evidence that the 42-year-old man shot and killed by a San Francisco Police Department officer last Friday was armed, Capt. 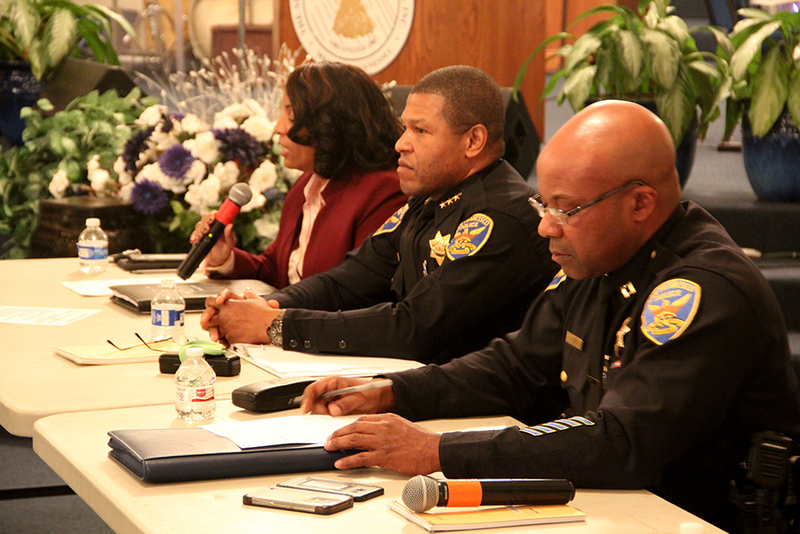 Valerie Matthews of the SFPD Major Crimes Unit told some 100 community members Thursday at True Hope Church in the Bayview. In response, residents at the community meeting questioned the purpose of the department’s reforms and called for charges against the officer who fired the single fatal shot at Keita O’Neil. Most of all, they challenged Police Chief Bill Scott, repeatedly asking the same question in different ways: what are you, as a reformer, going to do about this? Gwen Woods — whose son, Mario Woods, was shot more than 20 times by five officers in Hunter’s Point in December 2015 — addressed Scott directly after the officers showed footage of the incident. Scott, who took over less than a year ago, remained largely silent throughout the meeting, listening and nodding to the residents as they questioned the panel of officers from SFPD. The officers offered a description of how the shooting took place. Captain Matthews, sitting beside Police Chief Scott and Captain Steven Ford of the Bayview Station, said that on Friday at 10:30 a.m., O’Neil robbed a California Lottery van containing lottery tickets. Police chased O’Neil in the lottery van, which was “caravaning” with a gold SUV containing an unknown number of suspects allegedly working with O’Neil, Matthews said. After police detained the occupants of the gold SUV, police continued to chase O’Neil until he slowed the van at Fitzgerald Avenue and Griffiths Street. There, Matthews said, O’Neil got out of the van, ran past the passenger window of a patrol car, and was shot through the window by an officer, who has not been identified. The officer was reportedly a recent graduate of the Police Academy. That officer’s body-worn camera captured the incident. It was played twice for community members at the meeting. The footage shows the officer preparing his gun as the patrol car closes in on the lottery van. O’Neil then runs past the passenger window of the patrol car. The officer fires one shot at O’Neil’s head through the window, and O’Neil falls to the ground. The footage was met by shock and anger from community members, who at one point argued among themselves about whether the police should show the footage again. 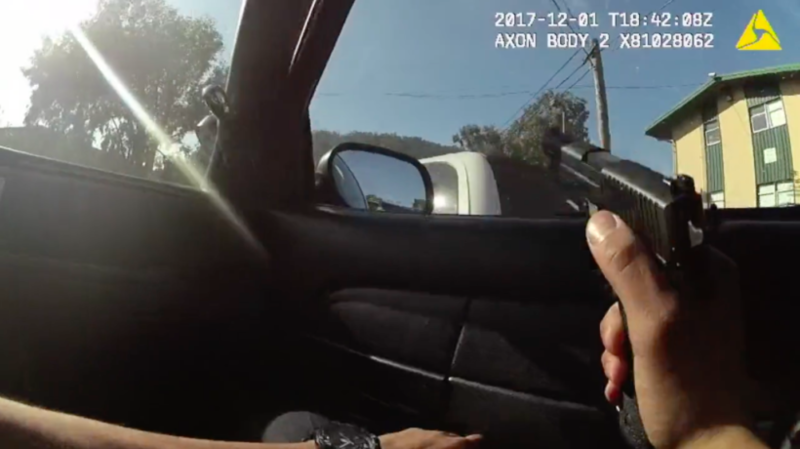 Body camera footage shows officer shoot Keita O’Neil, who was unarmed. Scott said the department chose to release the footage because it did not endanger the safety of anyone involved in the investigation, did not jeopardize the successful completion of the investigation, or violate anyone’s privacy. “I would like to remind everyone that the video evidence is only a portion of the investigation, and we are releasing it for the purposes of transparency,” he said. Still, many in attendance were angered by what they felt was another unwarranted killing of an unarmed person of color. O’Neil is now among the 20 people killed by the SFPD since 2011. District Attorney George Gascón has closed 11 such cases without filing charges. Nine, including the case of the officer who shot O’Neil, are still open investigations. The attendees broke into applause. Toward the end of the meeting, Bayview Station Capt. Ford told the crowd that, in many ways, he was a product of the Bayview, having not grown up there, but having spent a lot of time in the neighborhood. “I want everyone in this room to understand that I look at myself like a resource,” he said. “We’ll move forward when we get justice,” one yelled. “Clean it up!” yelled another. Overview of police shootings in the Mission District. Sounds like PD was in the right. Fleeing violent felon. They are allowed use lethal force to protect our communities from these violent psychopaths. There are many unwarranted victims of police violence. Why dilute their plight by apologizing for these criminals? This IS an unwarranted victim of police murder. He was unarmed. Stealing a van and running from cops NEVER warrants capital punishment. If cops are too big of coward to make the arrest, they need to turn in their badges and go do something else.